A reporter from the Cincinnati Enquirer walked up the driveway of my home on May 19, 2003..... The reporter.. (indicated) he was looking for Dr. Edward Patrick as he (the reporter) is doing a story on Dr. Patrick and Dr. Henry Heimlich. 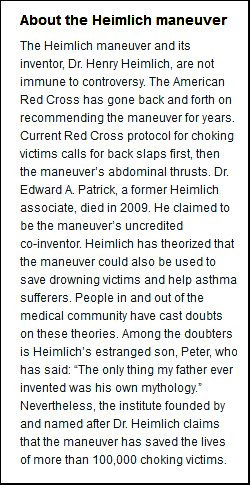 He asked why I did not get proper credit for the development of what now is called the Heimlich maneuver. I have the greatest respect for Dr. Heimlich, his work, and his contributions. He himself once told me that I have not received proper credit for the development of what has become known as the Heimlich maneuver. In any case, I am grateful to have had the opportunity to help develop a treatment for choking that has saved many lives. ...I have always viewed that Dr. Heimlich and I worked together to develop what has become known as the Heimlich maneuver just as the Wright brothers worked together to develop the first flying machine. Nine years after he issued the press release and eight years after being scooped on the story in 2004 by - no kidding - the Cornell Alumni Magazine, a few days ago the Enquirer finally got the information into print. The above boxed squib also marks the paper's first mention of a significant news event from Spring 2006. That's when the American Red Cross made the first major change in 20 years to their choking rescue guidelines by "downgrading" the Heimlich maneuver to a secondary treatment response. Better late than never, but you might expect more timely reporting in the city where my father introduced the maneuver in 1974 and where he's been considered an icon ever since. The Enquirer reporter mentioned in Dr. Patrick's press release, the one who showed up in his driveway? That was Robert Anglen, who left Cincinnati in late 2003 to work for the Arizona Republic. I know because at the time I was working closely with him. February 16, 2003 - Scientists Linked to Heimlich Investigated, exposing prominent UCLA researchers who were connected to the Heimlich Institute's notorious experiments in which Chinese AIDS patients were deliberately infected with malaria. The story went global, with separate bylined articles soon appearing in the NY Times, the LA Times, Reuters, and numerous other media outlets. 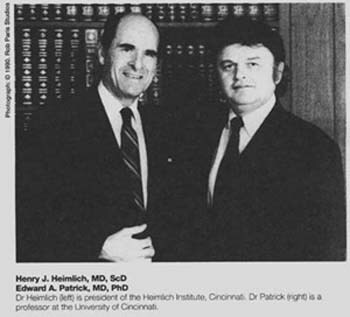 March 16, 2003 - Heimlich Falsely Claims He Invented Procedure, about how for decades my father falsely took credit for inventing an operation to replace a damaged esophagus. In Anglen's article, the actual inventor, Dr. Dan Gavriliu of Bucharest, called my father "a liar and a thief." Riding high on these stories, why couldn't Anglen get the "Patrick maneuver" story into print almost a decade ago? He told me he repeatedly interviewed Dr. Patrick who gave him some eye-popping quotes. And why did he leave the Enquirer? An enterprising reporter could certainly ask Anglen. 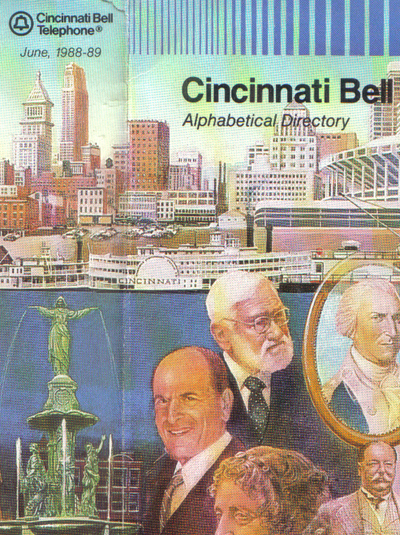 The result might turn out to be yet another journalistic landmark, Cincinnati-style.